← ProfileUnity is Infinitely Scalable and Highly Available! Back in July last year i tweeted something about the Software Defined Workspace™ – and i guess coined the phrase in the context of what we are up to here at Liquidware Labs. I am in fact a self proclaimed fanboy for SDx (software defined anything) because i have lived, for the past 25 years at least, in a world where just about every problem we faced was solved by HARDWARE. More hardware, faster hardware, cheaper hardware. And the paradox of Moore’s law is that while this worked in solving the performance related issues, wants, need we all had, and our users all had – its unintended consequence was sprawl, and creating a world where scale began to work against us. And it, to this very day, works very hard, Daily in fact, to make our jobs as desktop administrators very very difficult. We created a BEAST. This beast was something we could ignore in the past because the cheapened nature of hardware let us hire more people to handle the issue of scale. However, now that new paradigms like Virtualization, Clones, Cloud Apps, etc are teasing us with glimpses of how scale might now begin to work FOR us – we are tempted. We get it in some ways. What a very powerful thing to get back to ONE GOLD IMAGE for all of our users. Alas, what about the long tail of the 4mil windows apps our there? 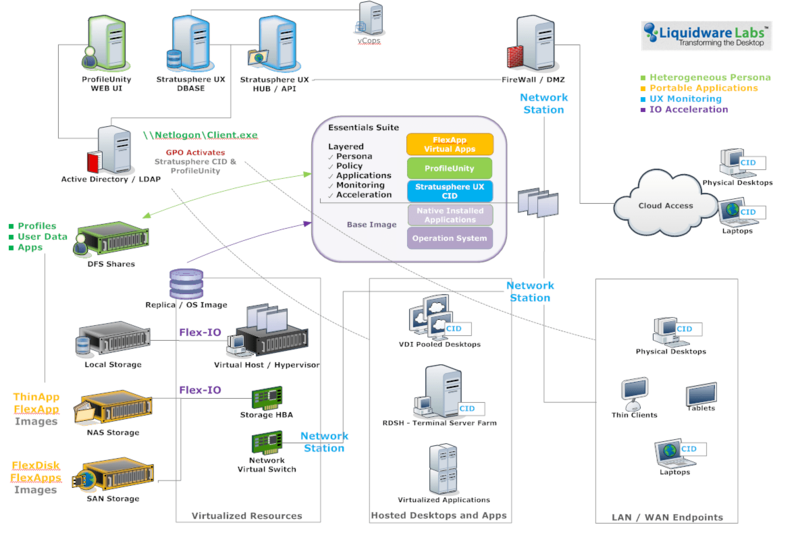 What if we virtualize all our apps? Alas, some apps need physicality and drivers. If even one app doesn’t work – we are back to square one. What if we get them all from the CLOUD? Alas, some apps need the above, and some need a local GPU or CPU to function right – again – leave one app out – and the whole plan falls apart. What about published apps? Awesome, cheap, good for some apps, and perfect for some users, but not all the time. And now i have a tablet, a phone, all of which run different processors and OS’s. I love these new mobile tools – though not all users in the enterprise need them – so once again fantastic new technology contributes to, and does not solve, this beast of scale. However, in the software defined workspace – it just might. Let me explain. There are so many, too many, possible combinations of the above examples for any human, or department to truly manage. But software can. All these different devices – connected, disconnected, arm, x86, laptop, desktop, thin clients, zero clients, Chromebooks, etc. All these difference OS’s and OS delivery methods from offline installed, to streamed, to server based and published to datacenter run (vdi/daas) . All these different Applications (4mil), all the different application delivery methods – abstracted, virtualized, cloud, SaaS, installed, streamed. Oh, and I as a user, and every single one of the 600million of us out there in the enterprise, customizes each of the above to increase our productivity or personal taste. Yup, a floating decimal point with no constant variable. In other words….a mess of scale. The Software Defined Workspaces acknowledges that no single element above will be singularly true, and by definition will be constantly changing, in real time, without warning, in a random, volatile, and unpredictable way. Instead – it makes decision based on CONTEXT. What if, and IF/THEN. Our ProfileUnity™, and FlexApp, and Flex-IO, and FlexDisk does just that. It’s intelligent enough to say – OH, the user wants to, or is doing THIS, so, do THAT. It allows administrators to say – if they log in from a laptop THEN THIS, or if its a Terminal Services Session – THEN THAT. Sounds simple – however i believe you will find that a Software Defined Workspaces is actually not just a buzz marketing term – but the first step to tame the beast of scale, knowing that your organization will never have just one device, delivery method, or application type. What you will find is that managing the User Environment with a solution like ProfileUnity is not 20% better than what you are doing today – its 20 TIMES better.